Chocolate cupcakes with a cheesecake pudding center and a raspberry buttercream on top makes these cupcakes disappear whenever we take them to parties. Prepare the cake mix according to the directions on the back of the box. Fill cupcake liners 3/4 full and bake at 350 degrees for 18 minutes or until top springs back. Let cool completely.In a mixing bowl, beat the cream cheese and sour cream on low until creamy. Add the milk and pudding mix and beat until mixed. Fold in the Cool Whip. Set aside. 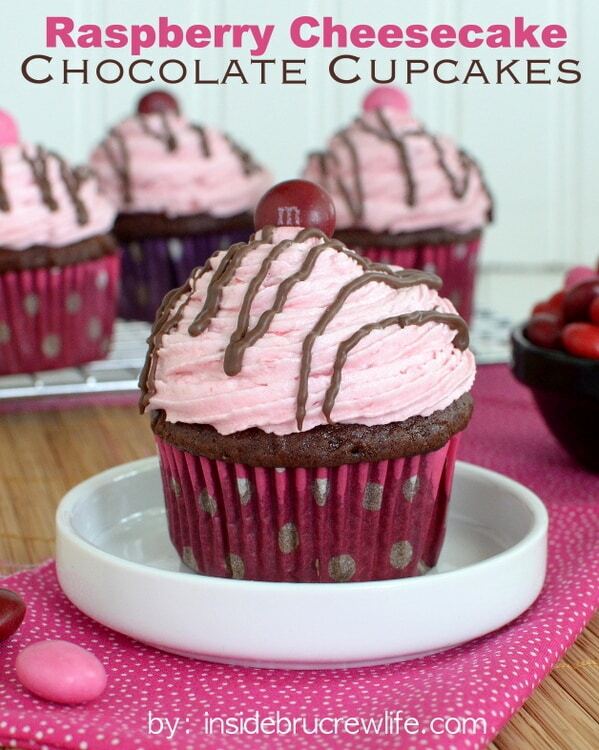 Visit Raspberry Cheesecake Chocolate Cupcakes @ insidebrucrewlife.com for full instructions.